What are the requirements to Port In my phone number? You will need the Account Number, and the PIN number, from your previous carrier. Unless otherwise specified below, please contact customer service for your previous carrier, to make sure you have the correct Account ID and PIN. -Account # is the SIM Card number and password is last 4 digits of phone number. -Your Account # is not your phone number. Contact customer service if you do not remember it. -The account number is listed on your www.budgetmobile.com/account/ account page. -The passcode is the last four digits of your phone number. -Log into www.budgetmobile.com/account/ with your BYO credentials to see your account number. - You set your PIN 24 hours before starting the port. Contact Cincinnati Bell customer service to begin. -Text ACCOUNT to 27336 to get your Account Number. -There is no passcode, use 1234 if the service you are porting to requires one. 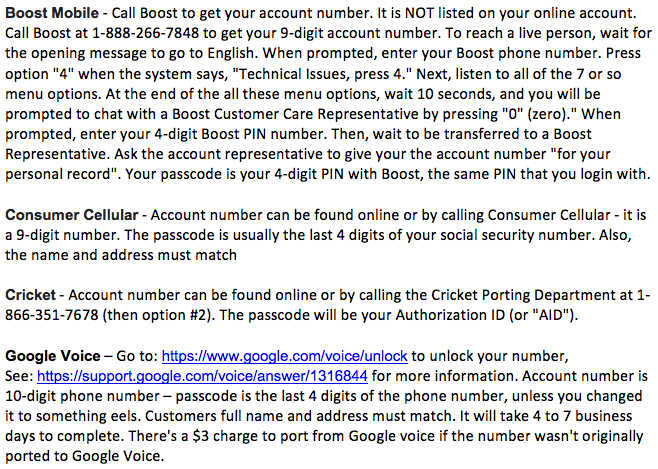 - Account number can be found online or by calling the Cricket Porting Department at 1-866-351-7678 (then option #2). The passcode will be your Authorization ID (or "AID"). - The account number is the phone's serial number IMEI or MEID. There's no passcode. - Account # is NOT the Phone Number – It is the MEID or IMEI serial number of the phone (this can be found on the back of the phone itself - under the battery, so remove the battery!) Or, if you are using a BYOP SIM Card, it will be the last 15 digits of your SIM Card number. You can also view the account number in the My Account section of the Telcel America website by clicking "Add (or Edit) Nickname".The passcode can be found on your online Telcel America My Account page by clicking Update Personal Profile where it's listed as Current Security PIN. If That field is blank, be sure to set up a passcode PIN before porting. - Dial #225# to view your account number. - Call Wallmart Family Mobile for the passcode. Note: Do not terminate your existing service! Your account with your previous carrier must be active at the start of the process. 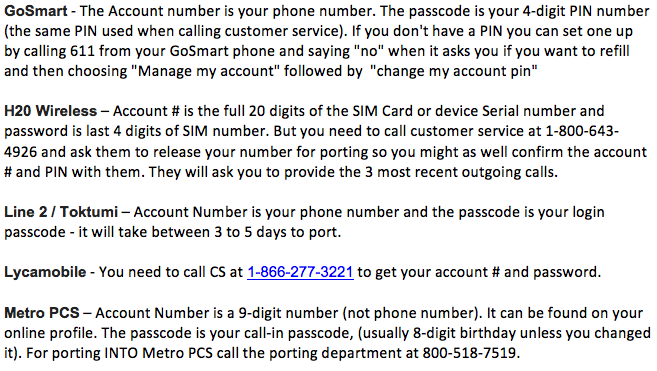 If you cancel service before the port completes, your account may be closed prematurely and you will lose your number. Select a FreedomPop number first (we provide you with a number for free). Click on Transfer Existing Number and enter your information. You can click here for a step by step video instructions on how to port in your existing number! FreedomPop (porting out to different carrier only) - Account number is your 10 digit phone number and your password is the last four numbers of the phone number. RingTo - Account number is your 10 digit phone number and your password is the last four numbers of the phone number. @Ali between this & the youtube video(see freedompop channel), porting should be much more diy now, great info! i have this post faved as well as the video. I am hopefully working to get all carriers Porting information up here soon! @ali hoping to do it on the zte force, I'm so stubborn I probably will no matter how long it takes & how much I scream! Just want to update everyone that porting from VIrgin Mobile doesnt work. Theres a bug for porting from Virgin Mobile. You can't receive text or calls from other carriers if you port in a Virgin number to freedompop. @Ali yes, I got the zte for my 'other half', @Simon Yue I hope we can get this straightened out for you, i'll see if I can get you some help. I have messaged someone who may be able to help you, I will update as soon as I hear something. @Simon Yue This is actually fixable with FreedomPop, porting from vm works. @weanut w00t, mine should be here anytime soon. @Simon Yue should have some info for you soon(like, today), hang in there. thanks! @Simon Yue Sorry to hear this Simon, we are not currently aware of such issues with Virgin Mobile but we will be taking a closer look, thank you for bringing this to our attention. Has anyone ported a number in to Freedom Pop from Skype? I have a Skype online number. I can make/receive calls with it. I think maybe its due to a land line issue with google voice that freedompop uses? I still cant receive calls and text after porting. You can try calling my freedompop number 6172331537 and after the 4th ring u will get an error message saying the number is invalid and doesnt exist. My phone doesnt ring at all but the caller will hear 4 rings and an error message. Dont know if freedompop can fix this bug because its over a month now. I can call/text people and surf though but no incoming calls or text. @Simon Yue Actually Freedompop does not use google voice for numbers/porting. They use a company called Bandwidth (which happens to be the same company used by google voice and other VOIP providers). Porting out is possible, but porting in is not supported. An account number - this is your Online Number you wish to port over. Your billing address - the address you entered when purchasing the Online Number. This information will then be verified by Skype’s telecom partner. Once the information is verified, your porting request will be approved. @Melinda Wolfe Are you trying to port a number into or out from FP? Normally number port are completed in 24 - 48 hours. With some providers the port can take up to 5 business days. If the port takes longer than 7 business days that is usually an indication there is a problem with the port (ie data submitted for the port not matching what the losing provider has on record). There are some providers that porting numbers out of are difficult. @Melinda Wolfe Richard Allen is our resident porting expert. if you are still having difficulties, let us know what company you want to port into or out of. then we can try to figure out what's going on. @Richard Allen if this started on 3/17, maybe get the admins in? I have called Safelink/tracfone twice to find out what needs to be done to have the number ported. They said that FreedomPop needs to call them to get the number ported into FreedomPop. 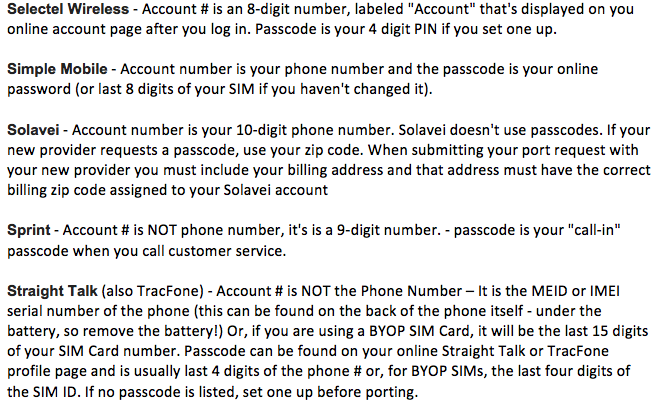 Here is the procedure for porting your tracfone number to FP. 1) verify you have a FP number assigned to your phone. 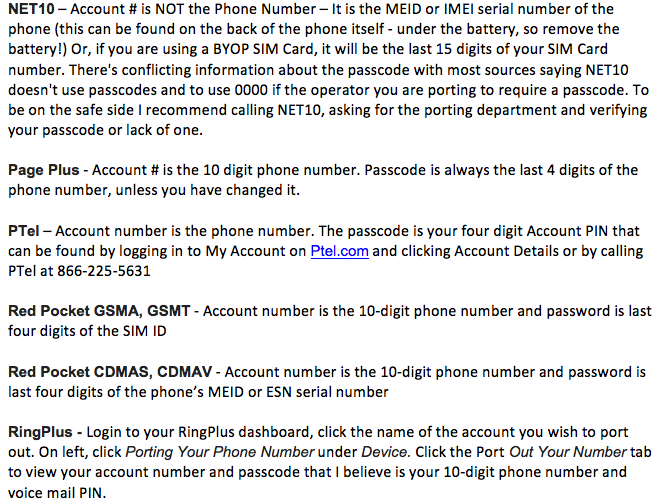 If you do not have a number assigned to the phone you will not be able to port your number. Log into your FP account. Go to my account, phone number. If there is no number assigned enter your area code, click search numbers and select a number. 2) Go to my account, phone number and click on the transfer a number tab. Enter the number you want to port. On the next page enter your account number, pin and billing address you have on record for tracfone. Porting should be completed in 24 - 48 hours. If it takes longer than that you probably will need admin assistance to get the port completed. 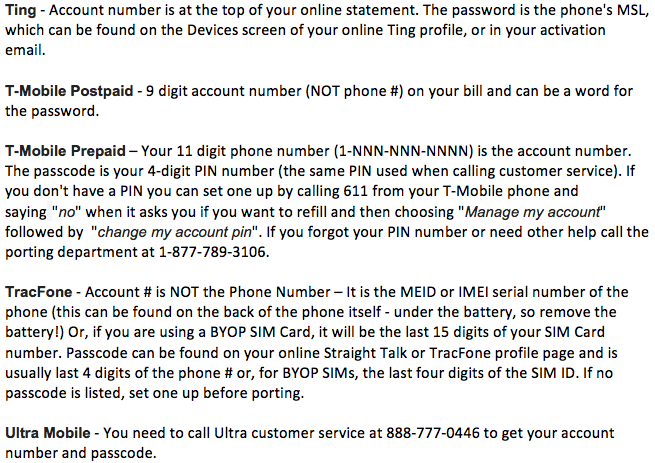 Straight Talk (also TracFone) - Account # is NOT the Phone Number – It is the MEID or IMEI serial number of the phone (this can be found on the back of the phone itself - under the battery, so remove the battery!) Or, if your are using a BYOP SIM Card, it will be the last 15 digits of your SIM Card number. Passcode can be found on your online Straight Talk or TracFone profile page and is usually last 4 digits of the phone # or, for BYOP SIMs, the last four digits of the SIM ID. If no passcode is listed, set one up before porting. @Melinda Wolfe ok, will round up an admin or 2 for you. thank you for being so patient. i will let them know this is a priority, hopefully will be resolved soon. Just checked the porting page, and there's an obscure message in Red that is asking for my PIN again. 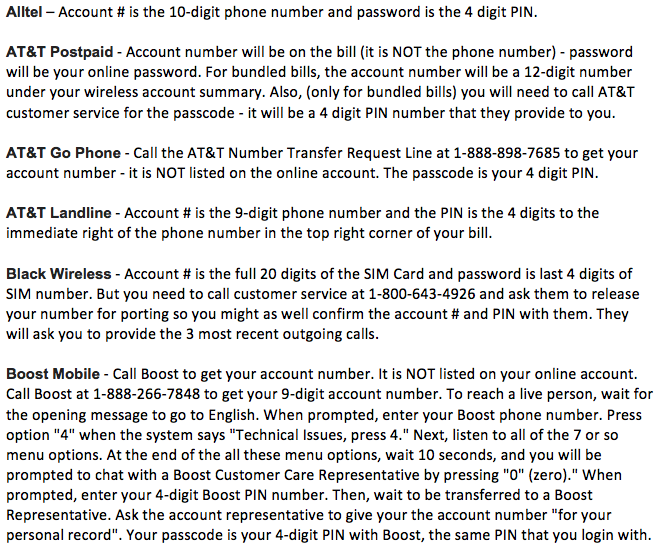 When I entered my Verizon PIN, the FreedomPop website wouldn't accept the code (it is in text, not a number). It accepted the last 4 digits of my SSN, but that isn't my PIN. I can't find a single link on this site to send some person a message, or to call support. Does anyone work for FreedomPop? Why can't I get support? I have been trying to port my phone number from Freedom Pop to another carrier for over a week and I can't. Freedom Pop keeps saying my information is incorrect when it's not. I have the correct account number, pin number, name, address... they verified my information was correct 5 days ago and I was told I needed to call back in 3 days. Now, they are saying my information is incorrect and I have to wait another week to transfer my number! Can anyone help me? I tried posting this on this forum under my regular account (that is registered with my FP account), but it wouldn't allow me to post anything... so I had to make up a new account name, and now I can post things. What is going on? Am I being censored? I also can not use Freedom Pop app to answer calls, make them, or look at texts or write them. Everything keep freezing up on my phone. Freedom Pop, please help! @Pooleywootch don't know what's going on with your issues with posting, or porting, but see if you can just post a new question with this account, say porting and account issues. you can give the info you gave here. an administrator should get back to you, and you can pm the personal info. it shouldn't take too long for someone to get back to you, this is the best way i know of to get help on freedompop.